Dietary vitamin E is ingested from plant foods, fortified foods, and/or dietary supplements as a mixture of the four tocopherols and the four tocotrienols and to a lesser extent tocomonoenols. 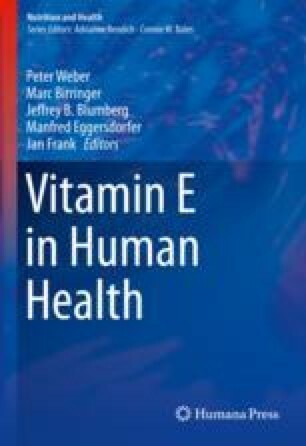 Natural sources of vitamin E and food supplements contain both free and esterified forms of vitamin E. Vitamin E has a high bioavailability of ca. 50–80% and follows the general absorptive route of dietary fats. Vitamin E is absorbed even in the absence of dietary lipids, but its uptake in the small intestine can be enhanced by simultaneous fat consumption. There is no discrimination between all congeners during absorption, but the liver preferentially incorporates α-tocopherol into lipoproteins that are released into the bloodstream for distribution of lipids to peripheral tissues. The enzymatic degradation of vitamin E to its short-chain metabolites, destined for urinary excretion, in the small intestine and liver is the most important factor regulating the retention of the different vitamin E congeners in the organism. In the liver, the cytosolic α-tocopherol transfer protein is required for the secretion of vitamin E into the blood and appears to limit the excretion of mainly α-tocopherol, but to a smaller extent also the non-α-tocopherol congeners, from the body, thus making sure that sufficient vitamin E is retained for its essential biological functions. Reboul E. Vitamin E bioavailability: mechanisms of intestinal absorption in the spotlight. Antioxidants (Basel). 2017. https://doi.org/10.3390/antiox6040095. Podszun MC, Jakobi M, Birringer M, Weiss J, Frank J. The long chain α–tocopherol metabolite α-13′-COOH and γ-tocotrienol induce P-glycoprotein expression and activity by activation of the pregnane X receptor in the intestinal cell line LS 180. Mol Nutr Food Res. https://doi.org/10.1002/mnfr.201600605.